There are the people in this world that love garlic and onions who could care less if they reek of them...and there are the onion/garlic phobes who fear smelling of the alliums and pick them out of just about everything...I am the first! I am always fitting garlic and onions into most savory dishes I make. I love roasted garlic the most...all soft and mellow, but with wonderful garlic flavor! Roasted garlic is wonderful just simply spread on bread, but I also love it pureed into dressings and sauces! 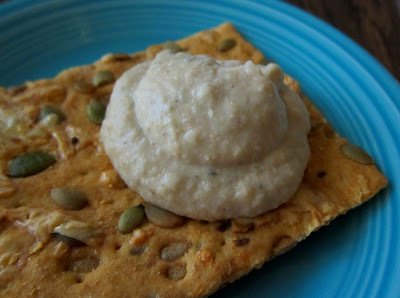 I recently made some hummus, and decided that it must have roasted garlic and onions included, since I had an overabundance of them on my counter, not to mention that they are delicious! I used white beans as the base, and almond butter instead of the traditional tahini. A bit of lemon and time found their way into the mix as well, to make the flavor more interesting. You could use any mix of alliums if you have them. Although I feel that this recipe must contain the garlic, feel free to substitute shallots or spring onions for the onions, or even leeks. They would all taste wonderful in this recipe! Preheat oven to 475 degrees. Wrap garlic in foil, and roast for about 45-55 minutes until very soft inside. Remove from oven and let cool. In the meantime, you can roast the onions at the same time. Line a baking sheet with foil. Toss onions and scallions with olive oil, spread out on baking sheet and roast for about 15-20 minutes, or until starting to brown and soften. Remove from oven. Squeeze garlic out of it's papery covering place in a food processor, along with onions and shallots as well as all remaining ingredients and process until smooth. Serve with chips or veggies for dipping! Hey Amy, I love white bean dip/hummus. You know, I've noticed your food looks really enticing most often. I think if you were a smurf, you'd be yummy smurf (smile)!